In November of 1647 the Shorter Catechism was presented by the Westminster Assembly to England's House of Commons for approval. And, in July of 1648 it was also adopted by the General Assembly of the Church of Scotland. It was to serve as "a directory for catechising such as are of weaker capacity". I can remember my reaction of near amazement a number of years ago when my eyes fell upon these words which described those for whom the Shorter Catechism was designed. After all, whether he be a child or adult, it's a rare bird indeed who can be found who knows the Shorter Catechism "by heart" these days. Very few in our congregations—including our pastors and teachers—have successfully mastered the rudimentary, systematic instruction in Christian doctrine which was to be for those "of weaker capacity". Thankfully, however, there seems to be a move afoot to begin changing this state of affairs. Here and there, fathers and mothers are gathering their children to them on Sunday afternoons to memorize and review the Catechism. Although the numbers at present are quite small, it is encouraging and exciting to be part of a generation of Christians who are beginning to recover yet another facet of the Reformed faith. But Why The "Shortest" Catechism? As I have personally struggled to catechise my own children, it has become more than obvious to me that, when very young, they are evidently of an even "weaker capacity" than those for whom the Shorter Catechism was originally written. Therefore, in an effort to simplify and shorten the material I wanted my little ones to memorize and yet still be faithful to at least the primary point being made by the Catechism, I began finding myself underlining portions of the answers. Q. "What rule hath God given to direct us how we may glorify and enjoy Him?" A. "The Word of God, which is contained in the scriptures of the Old and New testaments, is the only rule to direct us how we may glorify and enjoy Him." As I looked it over, it seemed reasonable to me to shorten it, by underlining the words, "The Word of God...is the only rule" which—at least to my mind—still kept the sense of the answer intact. And so, with few exceptions, I began to do this with a number of questions in the Shorter Catechism. I chose to do this rather than use some other "children's catechism" because I wanted my children to "grow into" the Shorter Catechism. This way, as the child matures, there is a question-by-question continuity with what he learned at an earlier age. This, I think, is far more to be preferred than to make a child jettison the almost too-simple catechism of his nursery years in favor of the Shorter Catechism once he is ready for it. Another benefit of using this form of the Catechism is that younger children are able to "keep up" with the older ones in the family as each memorizes his own answer to the same question. By the way, I don't presume to think this method is original with me. In fact, a cursory glance over many of the questions in the Larger Catechism seems to reveal that the Shorter Catechism is an "underlined" brief version of the Larger, still keeping much of the continuity with and sense of the answers found in its bigger brother. Ideally, once he has mastered it, one should be able to make the transition from the Shorter to the Larger Catechism without much in the way of unnecessary, added confusion. Likewise, if you start your youngest on the "Shortest" Catechism, he will one day make the transition to the Shorter Catechism quite smoothly. After all, he's almost there already! 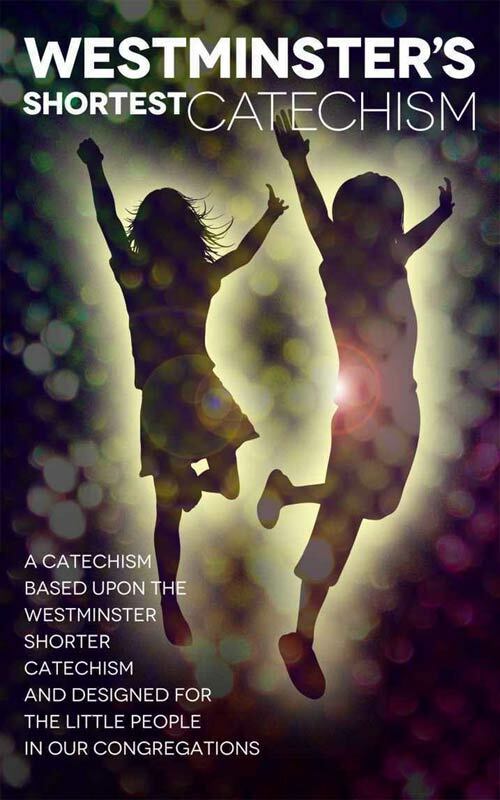 By naming this "Westminster's Shortest Catechism" I am not trying to fool you into thinking that this is a work of the original Westminster Assembly! But, without trying to be too cute, there is an intentional play on words here. What is being suggested here is that you will not only find a simplification of but also a real continuity with the original Shorter Catechism. Finally, it is my hope that parents everywhere will find this "shortest" catechism to be helpful to them as they work and struggle to instruct their children in the nurture and admonition of the Lord.